Sensory printing: Is it time your prospects came to their senses? The average consumer is assaulted by over 3,000 messages and advertisements per day. It’s no wonder they have erected mental walls to deflect this firehose of content pouring into their eyes and ears. So how can you reach them with your messages? How can you cut through the noise? By using a guerrilla tactic they’ll never expect: by appealing to their senses. Sights, sounds, scents, tastes and touches can evoke powerful memories. Have you ever gotten a whiff of something that instantly makes you feel nostalgic? Fresh-baked cookies may remind you of the years you spent baking treats with your grandmother. A crackling fire makes you think of all the holidays you spent together eating homemade cookies sitting side by side in front of your grandma’s fireplace. Before you know it, you have a whole scene painted in your mind: how the cookies tasted, what the kitchen smelled like, hearing your crazy uncle sing “Jingle Bells” for the 100th time, the laughs you shared together — all the wonderful feelings you felt. These same feelings can be evoked through marketing and direct mail. Appealing to the 5 senses can conjure up happy images, sensations, memories and associations in the minds of your prospects – effectively side-stepping the mental walls they have erected to keep commercial messages out. Would you like to learn more about the impact that sensory marketing can have on your customers? 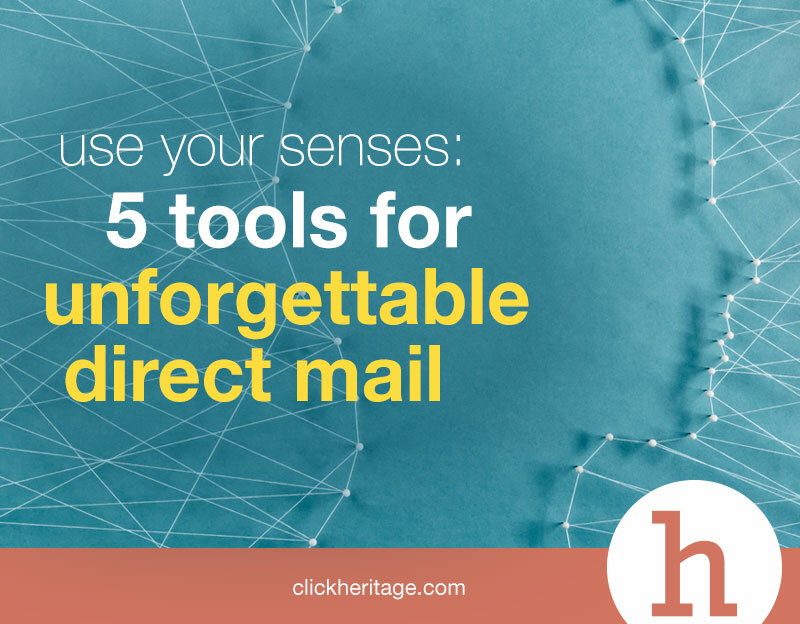 Check out this fantastic SlideShare for more information: Direct Mail: It Just Makes 5 Senses. And see this info-packed Heritage article to learn how to use tactile, visual — even olfactory — stimuli on your next printed piece to magically catch and hold the attention of your target audience.